If you are welcoming a new baby with Down syndrome into your family, you probably have many questions and concerns, as do your extended family, friends and neighbors. We have written this information considering our own diverse experiences when we gave birth to our children with Down syndrome. Allow your family, friends and neighbors some time to learn about Down syndrome, reminding them if necessary that Ds is just a small part of your child’s identity. It is a small part of your child’s genetic makeup. Staying integrated in your mainstream community is important to your child’s development and your peace of mind. Try to get some rest. You are allowed to feel however you feel, and so are others who love you and your baby. Childbirth is hard work; many of your emotions stem from a new life coming into your family. You deserve congratulations and wonderful gifts. Have the good cooks among your family and friends bring over their best meals. Take time to welcome and enjoy your baby. They grow up fast. 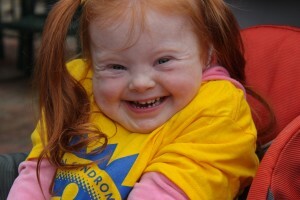 Expectant parents want up-to-date information about Down syndrome, its causes, and expectations for a child living with Down syndrome today. The following websites are incredible resources for new families. 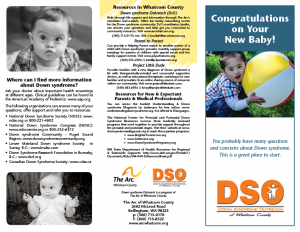 Please contact Down syndrome Outreach if you have any questions regarding these resources. 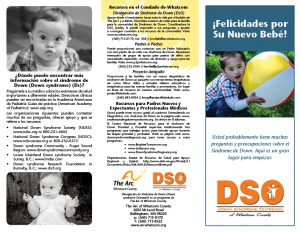 This booklet, by Lettercase, was prepared with assistance from the Down Syndrome Consensus Group which includes representatives of The National Society of Genetic Counselors, The American Congress of Obstetricians and Gynecologists, The National Down Syndrome Society, and The National Down Syndrome Congress. It is also recognized by the WA State Department of Health as a lead resource for new families and physicians. It is available on computer, phone or tablet. This booklet is offered in English, Spanish, Korean, Vietnamese, Japanese, Chinese, Russian, and Somali. Click here for more information about how to order the Understanding a Down syndrome Diagnosis booklet and other resource materials.